Watch along at 11:45 PM Eastern. 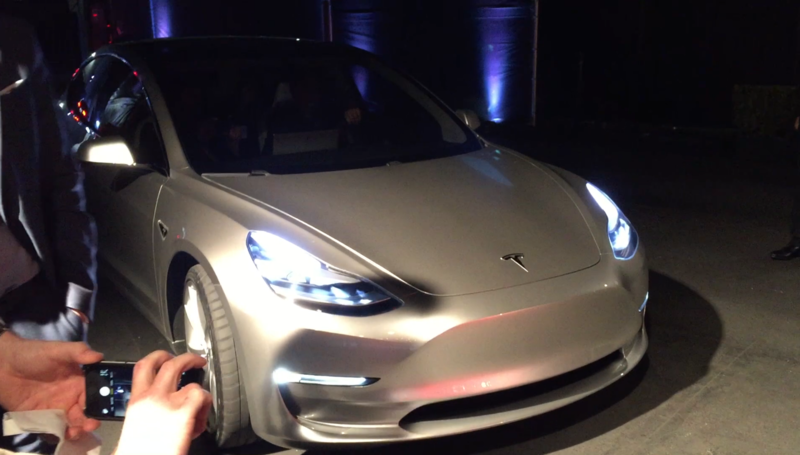 The Tesla Model 3 will start at $35,000. It's smaller than the Model S, at 184.8 inches (compared to the 196 inches of the S), and seats five adults, with 14 cubic feet of cargo space. According to Tesla, it does 0-60 miles per hour in 5.6 seconds, and offers at least 215 miles of driving range. The wait will be long for new orders, at over a year according to a product sheet released in May. Model 3 owners will have to pay per use each time they charge on Tesla's Supercharger network. It's eligible for the $7,500 federal tax rebate, but that won't last long. That rebate is only available to the first 200,000 customers per automaker before dropping down a tier. Tesla delivered about 112,000 cars by the end of 2016, plus another 47,000 estimated units in the first half of this year. Once Tesla hits 200,000, customers will be eligible for a $3,850 credit for the next six months. After that, the rebate drops to $1,875 for another half a year before expiring completely. You can bet reservation holders are crossing their fingers that Tesla ramps up production as quickly as possible so they can take advantage of any remaining tax credits. Tesla is also is expanding its service network and Supercharger network to accommodate the new customers, too. The first Model 3 to roll of the line will go to Elon Musk. Tesla board member Ira Ehrenpreis, who was the first to actually put a deposit down on the car, gave his place in line to CEO Elon Musk as a birthday gift. Tesla has been making changes to the rest of its lineup in advance of the Model 3 launch. It's getting rid of the cheapest Model S, the RWD 75, which will create a further price gap between it and the Model 3. It has also streamlined the options in the Model S and Model X, even going so far as getting rid of leather seats. Whether that means the Model 3 will have the same seating surface options is unclear. As much as we already know about the Model 3, there's plenty more that we hope to learn tonight at the handover event. For one thing, we hope to hear official battery capacity, and a more solid driving range figure. As a smaller car, it won't need the same capacity as its larger siblings to achieve 215 miles, but we've been given no official kWh figure, and it's unclear how many battery options there will be to start. Also, we don't know how much that plus sign following the "215" signifies in actual driving range. We're not sure what sort of key fob it will have. It may not sound that exciting, but rumors have been floating around about a key card that could possibly offer the convenience of fitting in one's wallet. Is it possible that we catch a glimpse of it in this video of Tesla Senior Vice President of Engineering Doug Field driving off in the Model 3? We don't know what sort of configurations it will offer. We know that they'll be limited compared to the Model S, at least at first, but we don't know what they'll be down the line, or what they'll cost. What sort of surprise does Musk have in store for us? One thing the Tesla CEO does really well is get the audience, media included, to listen attentively in the hopes that he'll reveal some big bombshell, perhaps as a "Just one more thing" sort of moment. While that's not always the case, tonight is as good as any other to reveal some new, important piece of information about the Model 3 that would drive up sales, or even to make an announcement about something else Tesla is doing (which is an increasingly diverse business model at this point). One last thing we know to expect from tonight's event is the announcement of the winner of Project Loveday. The video contest for fan-made Tesla ads has been whittled down to 10 finalists. Tesla has posted those 10 films on Twitter, and the three that get the most votes/likes will be shown at the handoff party. You have until 5:00 PM Pacific today to cast your votes. We hope you'll visit Autoblog and AutoblogGreen as we watch the handoff of the first 30 Model 3s tonight. We'll be watching the livestream, providing news coverage here on the site, and, depending how fast our little fingers can type, offering commentary and conversation on AutoblogGreen's Twitter and Facebook accounts, as well as in the comments right here on Autoblog.